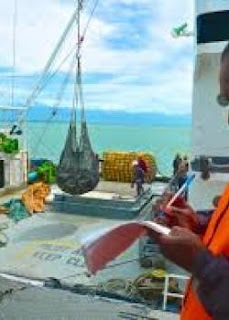 The National Fisheries Authority (NFA)in Papua New Guinea will consider wristbands and implants among other measures to monitor the country’s 272 observers on board vessels. This is according to Fisheries Minister Patrick Basa in Parliament after concern was raised about Papua New Guinea going missing since 2008. The country’s observer programme is one of the largest in the world. The main purpose is to collect and report all reliable and accurate fisheries information on science, management and compliance purposes. Basa told Parliament: “The NFA observer programme has equipped all our fisheries observers with a personal life-saving beacon (PLB), personal floating device (PFD) or life jacket, an inreach to send message from the vessel to headquarters through the Fisheries Information Management System operated by the NFA on real time basis with all the officers being connected through this network 24 hours, seven days a week to receive alert messages with a table that is attached to this inreach device. “The issue of observer safety is not only of concern to PNG Government and the NFA. This is also regional issue and is addressed by the Western Central Pacific Fisheries Commission through Commission Management Measure 2016-03. “I have tasked NFA to continue to upgrade its systems to address all these fisheries observer issues in regard to all observer safety measures. I have also tasked the NFA to explore other avenues that can be used to monitor observers, including the issuance of monitoring devices in the form of wristbands or even implants. Basa said investigations were being carried out on the four observers who had gone missing, not 18 as reported in Parliament last week. He said three of these underwent both fisheries and police investigations after which appropriate compensations were made. Only one was taken to court but was dismissed for insufficient evidence.